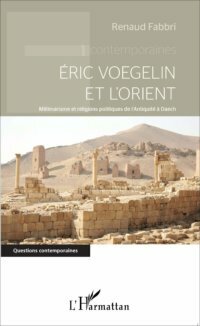 Éric Voegelin et l’Orient: Millénarisme et religions politiques de l’Antiquité à Daech. Renaud Fabbri. Editions L’Harmattan, 2016. Renaud Fabbri is a professor of political science at l’Université de Versailles. Over the past few years he has been quietly blogging away at a post-secular age, applying the ideas of Eric Voegelin to Hinduism and Islam. Éric Voegelin et l’Orient seems to be his first book and it is a very welcome addition to Voegelinian thought indeed. Just about anyone familiar with Voegelin’s output should be able to admit that what he had to say in relation to India and Islam, two of the most important players in world history, was inattentive at best and perhaps downright woeful, Eurocentric and dismissive at worst. Voegelin was a very prolific thinker, yet one cannot do equal justice to everything one supposes. Happily, Fabbri is seeking to remedy this by charting what he sees as a decline in Hindu and Muslim luminosity into immanentism, nationalism and millenarianism in the form of contemporary phenomena such as Daesh (ISIS) and the Iranian Revolution. As one might expect a great deal of the blame for these eastern “political religions” falls squarely (and rightly) on “Gnostic” influences absorbed from the West during the colonial period: Hegel, Marx, Nietzsche, “process theology”. At 123 pages Eric Voegelin et l’Orient is a very short text. My overwhelming sense when reading it the first time was that it is simply an opening salvo for a much larger and more detailed work we can expect from Fabbri in the near future. Moreover, one can tell Fabbri is a blog writer. Even in producing a monograph he writes in linked short bursts of a few pages on certain important figures in the history of the two religions in question. However, this is not to denigrate the book; rather we should celebrate it for its adventurousness. Fabbri is an abstract and thematic thinker, like Voegelin at his most experimental. Anyone picking up this book expecting something akin to the Voegelinian-Straussian The New Political Religions, written not long after 9/11 on the pneumatopathological history of Islamic terrorism (including its eye-opening essay on the ethics of suicide bombing), is going to be more than a little surprised. Fabbri leaps around, he reads between the lines and conjures up obscure thinkers, both as nodes in the history of the decline of Islamic and Hindu religious experience, and as accessories to aid him in his explorations. The two most important accessories Fabbri uses besides Voegelin are the French thinkers René Guénon and Henry Corbin, the former of which he uses largely in his discussions on Hinduism and the latter on Islam. Many readers may not be familiar with either of these so perhaps a little explanation is in order. Guénon is the father of an esoteric movement known commonly as Traditionalism or Perennialism. He believed that for all the diversity of the world’s religions, they call contained a transcendental unity of shared truth. Ergo, Guénon was a universalist, a very unpopular opinion in our post-colonial era. However, he was a very eccentric universalist, even for the early 20th century. The basis of Guénonian history is the idea that the cosmos passes through cycles of decline, from all quality and no quantity (=God) to all quantity and no quality. This comes to a final Kali Yuga, a scientistic “reign of quantity”. Finally the world collapses into total atomisation and spiritual decay before another Golden Age begins. However, this does not tend to make Traditionalists millenarians trying to force the Golden Age to come back. There is of course the exception of far-right outliers such as Julius Evola and Russian “New Rasputin” Aleksandr Dugin, in whom there is at least as much Nietzsche as Guénon. In my experience with Traditionalists (all my teachers when I was an undergrad religious studies student were Guénonians), there is a far more profound sense of a pessimistic acceptance of a pre-determined order to things. There are no “Guns, Germs and Steel”, theories about millenarian “political religions” or Heideggerian blame-Plato-for-the-reign-of-quantity in Guénon. The West simply drew the short straw in a natural cosmic process. Nonetheless, in Guénon’s successor Fritjof Schuon one can certainly find the idea that the West was metaphysically broken from the start because of Greek rationalism, scepticism and materialism. To Schuon Islam and Christianity got more out of the Greeks than they got out of themselves: “The true “Greek miracle, if a miracle there be – and in this case it would be related to the “Hindu Miracle”- is doctrinal metaphysics and methodic logic, providentially utilized by the monotheistic Semites”. The aim for the Traditionalist becomes to find what is left of an imagined universal sophia perennis of esoteric truth in Sufism, Hinduism, the Western Hermetic traditions – the part of inferno that is not inferno, so to speak. Thus, as one might imagine, Fabbri seems to believe that the Guénonian narrative of decline can be laid over the Voegelinian narrative of pneumatopathology. There are problems with this, perhaps. Compared with Voegelin’s open-ended “order in history” as the produce of human experiences of social crisis, there is very little metacritical about the deterministic Guénonian historical narrative. All of this is amusingly epitomised by the Guénonian who put me on to Fabbri and his book: “Oh Voegelin? Too historicist for my liking. But then again you have to be if you want the academy to take you seriously.” However, I think that what Fabbri has done, nonetheless, is attempt a highly original experimental dual focus using both thinkers well, yet erring on the side closer to Voegelin and historicity. Now, so one might think, to Voegelin all this would be a good thing – none of the dualism and millenarianism that caused the decline of Near Eastern and Western religious experience into secular political religions. However, Voegelin simply seems to snub India as something which never really went anywhere. He shows some passing interest in the Greco-Bactrian cultural exchange, but the only thinker of note is Shankara with his advaitya vedanta. This is perhaps because of similarities between the neti neti (God is not this, not this) of Shankara and the via negativa (negative theology) of the Christian Cloud of Unknowing, which Voegelin initially took to be a Gnostic text, but later came to embrace because of its refusal of “Gnosis”- ultimate positive knowledge. There are other problems, small but niggling. We are never even told by Voegelin whether, as with China and its t’ien hsien (all under heaven), anyone in Indian history ever attempted to symbolise a universal “humanity”. Even more invitingly, as Fabbri (p. 39) suggests, we are left wondering why Voegelin never had anything to say about the great Indian epic the Mahabharata. Let’s hope that Fabbri or someone else in the near future gets around to fixing this. I would love to read such a thing. Fabbri attempts to turn Voegelin’s remarks on their head. From a Guénonian perspective India’s atman and lack of “historicism” makes it far more spiritually healthy. To Fabbri India represents a more complete primordial view of things, spared from the dualism inherent in monotheism that leads to obsessions with mastery over nature and the millenarian immanentisation of an alien God (pp. 40-1). This only begins to come apart with the introduction of Western ideas during the colonial period (p. 43). Fabbri’s main target of interest is Sri Aurobindo, a British-educated turn of the century figure who reshaped Hinduism towards a progressive view of history – a Hegelesque “integral” view of the world. The whole world comes to be united in a futuristic enlightened communist consciousness emanating from India and its god-man sages (pp. 49-60). Indeed Aurobindo and those like him such as the Theosophists have done a lot of damage to Indian thought. Without them there would have been none of the “New Age” millenarianism of the 60s that the West (and India) came to be soaked in. What is curious, and what Fabbri fails to mention, is that Guénon initially had some enthusiasm for Aurobindo, but eventually realised that his evolutionism was a modern corruption of the traditional Hindu cyclic view of history. However, the supreme sin of Aurobindo for Fabbri is the fact that he transformed Maya, the veil of illusion separating the individuated entity from realising it is part of atman, to Lila, merely the cosmic playfulness of entities coming into being and perishing (p. 57). The phenomenal world becomes a joyous, immanentised plenitude, reminiscent of “process theology”. Such views in my experience are of course extremely prevalent in New Ageism and its gutting of Hindu thought, especially the twee Spinozism of “Deep Ecology”. This brings us to two curious absences in Fabbri’s take on India. The first is that although he traces the influences of Aurobindo down to modern Indian nationalism and communism and New Age gurus, he does this perhaps too succinctly. For instance, he mentions Radhakrishnan only in passing (p. 48). This thinker not only actively engaged in attempting to square Hindu thought with western progress narratives, science and “process thought”, but also played an enduring part on the international stage as a representative of Indian nationalism. At least something on this figure would have been welcome. The second issue is that although Fabbri (p. 41) mentions the idea of the kalki-avatara, the tenth and final avatar of Vishnu, who is supposed to come at the end of this cosmic cycle to renew the world, he never queries whether even this idea might have come from the millenarianisms of the Abrahamic religions. Some thinkers have certainly asked this before, as also in regard to the closely related legend of the eschatological kalki kings and armies of Shambhala in Buddhism, for which at least some Islamic influence has been posited. Nonetheless, Fabbri (p. 42) is very much right to remind us that there are thousands more years of the to go before any kalki-avatara might be expected. Anyone, especially all those dubious New Age gurus, who claim otherwise, seem testament to the idea that millenarianism should perhaps be called the opiate of the Kali Yuga. Everyone wants out but Great Disappointments keep on coming. Whether we are talking about “Gordian Knots” or “sliding over”, for all the briefness of Voegelin’s observations, there would certainly seem to be something profound to work with here. It seems that Islam, like Christianity with its Heavenly and Earthly City, millennium and later its “two swords” of Church and State, was troubled from the moment it began to set down concrete notions of the historical finalisation of the nature of things. This brings us to the second basis for Fabbri’s history of Islamic spiritual decline – his reliance on the ideas of Henry Corbin (pp. 70, 83-5). Like Guénon, the name of Corbin in not well-known (except perhaps within Islamic mystical circles or in the writing of Norman O. Brown). Corbin was the first French translator of Heidegger, but his main importance comes from his enterprising work on angelology and proposed Zoroastrian influences in Shi’a Islam. Corbin describes the existence of a “mundus imaginalis” (imaginal world) – a medial realm between man and God – peopled by angelic beings. This Nâ-Kojâ-Abâd, “Country of Non-Where”, or “Eighth Clime”, is accessible only through the consciousness and is the organ for the reception of the visions and prophesies that are brought to men from God via the angels. The “imaginal” is not to be confused with modern western understandings of the “imagination”, which largely view this term to mean simply a source for entertaining aesthetic produce or downright falsity. Imagination isn’t “fantasy”. However, so I am tempted to propose, if one looks closely at the history of these two terms their confusion seems to lie in the mediaeval reception of the ideas of Avicenna in Europe. Many tangled arguments ensued over which term meant a purely receptive capacity for external images and inner divine visitations, and which the organ of active creativity from pre-received material. What both Corbin and then Fabbri do is chart the history of Islam as the history of the decay and forgetting of the angelic reality – the death of ongoing prophesy. As one might imagine Fabbri finds similarities between the medial nature of this “mundus imaginalis” and Voegelin’s metaxy or In-Between and his reading of history as the breaking down of this dynamic experiential system into dualism and then immanentism. Without a “resolving third” full of intramundane spirits and myths one’s ecumene and consciousness becomes very empty indeed. Fabbri also sees this inherent in the discarding of the cult of the gods, the Ishtadevas, in Hinduism by thinks such as Aurobindo. In a later essay I would like to return to such questions in relation to the history of the West and its own loss of angels. However, for now it is more important to emphasise that all this means that both Corbin and Fabbri come down hard on the side of Shi’a rather than Sunni Islam. The root of Islam’s issues is the “tragédie fondatrice” (founding tragedy) of the Sunni-Shi’a division (the fitna), just as much as the “Gordian Knot” of prophesy and empire mentioned above. For the Shi’a, prophesy kept on going to a certain point, depending on how many Imams each faction take to be rightfully guided, up to the Great Occultation of the mahdi – the imam in hiding. For the Sunnis, Muhammad was the “seal of the prophets” and that was that. This means that those claiming to be the recipients of new prophesies and divine knowledge have always had a strained relationship with mainstream Islamic thought. Fabbri (pp. 74-7) lays out the history of these difficulties through figures such as Al Farabi, whose mixture of Platonism and Islamic revelation produces an image of a proto-Kantean world state ruled by “philosopher kings”. Following Corbin, Fabbri (p. 75) ponders whether Farabi was a “crypto-Shiite” trying to think beyond the Grand Occultation of the last imam. Another important thinker is the Sufi Ibn Arabi who represented the rulers from Adam to Muhammad as God’s representatives on Earth, and those thereafter as simply secular rulers. History instead is controlled from the outside by the saints and angels. As Fabbri (pp. 88-9) notes there is something strongly anti-millenarian and “realist” about this. Yet, at the same time, this descacralisation of the caliphate opens up the space for a “spiritual anarchy” where the secular rulers are unimportant compared with the Gnostic claims of holy men. The “Gordian Knot” problem leads down to the “presque schmittienne” (almost Schmittian p. 90) political theorisations of Ibn Taymiyya. Here maintaining the sharia and the temporal rule of the Islamic states against heathens becomes the onus. So too is the cult of the saints pejorated as idolatry, leaving no intermediaries or intercessors between man and God. The genesis of Islamism then emerges in a kind of dual spiritual desperation. On the one hand there is the destruction of the Caliphate by the Mongols (and later the collapse of the Ottoman Empire). On the other there in an increasing shutting out and disappearance of prophetic claims and the intercession of saints. What then emerges is a kind of panicked assumption that if the Caliphate is restored, Islamic consciousness then too will be restored to how it was during its early period. Increased persecution of Sufis, attempts to rid foreign corruptions from an imagined pure, original Islam and abject literalism ensue through Abd al-Wahhab, Sayyid ibn Qutb and other prominent thinkers among contemporary Sunni Islamists. Fabbri (pp.91-3), in comparison with The New Political Religions, only gives these influential thinkers a couple of pages and he has nothing to say about Westernised Pan-Arabist movements like Ba’aathism. He remains far more interested in the stranger, more obviously “Gnostic” cases. Fabbri (pp. 95-101) then descends into the influence of Western political religions on Islam during the colonial period. The most important thinker here is Muhammad Iqbal, who attempted to square Einsteinian cosmology, and the “process” thought of Whitehead and Bergson with Islam, and ends up producing a series of bizarre “Gnostic” visons about modernity. Marx becomes the angel Gabriel of the new age, feminism appears manifest as a monstrous Priestess of Mars. Reading all this strongly reminds me of the way in which in the Soviet Era the old religious and heroic oral epics of “minorities” in the USSR were secularised to replace millenarian heroes such as Geser Khan and his titanic foes with Marx, Engels and Lenin flying through the cosmos battling the fifty-headed hydra of capitalism. The strange syncretism of the old religions and the political religions seems to have got into everything in the twentieth century. Finally, Fabbri (pp. 103-11) comes to Ali Shariati, Khomeyni and the Iranian Revolution. Fabbri deftly notes the influence of a number of Western thinkers such as Sartre and Marx (“red Shi’ism”) on the formation of these ideas and the degeneration into millenarian theocracies ruled by Gnostic “philosopher kings”. Yet, there is one very obvious absence in his analysis. This is Heidegger. Fabbri mentions Heidegger numerous times throughout Eric Voegelin et l’Orient in connection with globalism, subjectivity, technology and nihilism (pp. 30, 46, 50, 58, 100). However, like his references to Leo Strauss (ie. pp. 99-100), Heidegger is always cited as a kind of minor accessory – one of the “good guys” – but not as important as Corbin, Guénon and of course Voegelin himself. Fabbri does not at all mention how the influential concept gharbzadegi (“westosis/weststruckness”- being infected with western nihilism) from the Iranian Revolution is nearly entirely down to Heidegger’s influence through Ahmad Fardid, who propagated Heidegger’s ideas about cultural “authenticity” in Iran and organised a group of “Iranian Heideggerians” in the 1970s. Fabbri (p.104) in passing names Jalal al-e-Ahmad who popularised the concept, but Ahmad and his Heideggerianism is never dealt with at all. Heidegger is a very troublesome thinker, far more than the occasional ritualistic hand-wringing about his Nazi period in contemporary continental philosophy usually conveys. Heidegger’s embrace of Nazism has its basis in the idea that the Germans had a unique primordial and “authentic” link with the Greeks and Being, which was under threat by the flattening effects of capitalist and communist nihilism. There is quite a profound legacy to this idea of one’s people possessing an ancient and unique manifest destiny and identity to overcome global nihilism. Shortly after Heidegger’s infamous Rektor speech in 1933, some of the Japanese philosophers of the “Kyoto School” such as Keiji Nishitani, who studied with Heidegger, took this up, replacing Being with the Zen Void, to construct a Japanese imperial manifest destiny. “Reactionary” Heidegger returns in the Iranian Revolution and more recently in the “Fourth Political Theory” of Aleksandr Dugin and his obsessions with building a Eurasian Empire to combat the “post-liberal” monster of globalised American consumer culture. As Foucault said of the Iranian Revolution – it was to be the first great rebellion against the Western “world system”. Just as much as Heidegger, his reputation never managed to live this down. Thus, I think that Fabbri should have expended at least some attention on dealing with the millenarian and deforming aspects of Heidegger’s ideas outside the West. In comparison, perhaps, as Chinese Heideggerian Yuk Hui has recently shown with his book The Question Concerning Technology in China, which touched upon the uneasy Heideggerian legacy in Dugin and the “Kyoto School”, there might be some hope of using Heidegger’s later ideas to undertake culturally-specific “rememberings of Being” without it all just turning into a “metaphysical fascism”. This possibility is based around re-investigating how imported Western conceptions of technology have covered over the ongoing relationship between Qi and Tao in Chinese philosophy. Knowing the dangers of an emerging China simply repeating Western global empire building and technological nihilism seems to be the first step; to live with technology China must learn to reintegrate it, the world, life and society together into a “cosmotechnics”. One can only hope this doesn’t backfire and we end up with some sort of exceptionalist Taoism with a transhumanist immortality complex. Heideggerian “traditionalism” remains a dangerous animal. Fabbri draws his book to a close by attempting to consider how to deal with contemporary Islamism. Although one is unsure of his political leanings, he does seem very much aware of the weaknesses of the contemporary left and right in Europe (though it could be America, Australia…) in understanding Islam and its history. To the liberal left Islam is a magical victim, which must be defended at all costs, often to the point of naivety; to the increasingly reactionary right and the actively anti-religious left it is simply anathema – it has no place in Western society (p. 121). Fabbri’s (pp. 116-9) beginning of an answer to this is in the vague hope he seems to find in the figure of Tariq Ramadan, a popular Islamic public intellectual. Ramadan believes that Islam needs to reform the Sharia for the “complexities” of the modern world and understand that there is a “double revelation of God” – the koran and nature. What is it that Fabbri finds promising about Ramadan? It simply seems to be that he is not necessarily a priori against the ideas from Sufi thinkers (p. 118). This doesn’t really sound like much. Fabbri himself recognises that Ramadan’s attitude towards the metaphysical aspects involved in the nature of modernity and Islam are gravely lacking. Moreover he admits that Ramadan is rather “naïve” in his attempts to square Islam with modern science. All in all to Fabbri (p. 116), Ramadan “illustre bien la vitalité mais aussi les limites de cette literature de résistance au fondamentalisme en terre d’Islam” (illustrates well the vitality but also the limits of this literature of resistance to fundamentalism in the Islamic world). These days there seem to be “Ramadans” everywhere, many far worse than the man himself. Some of them are atheists simply flying the identity politics flag of “cultural Islam”. They people TV talk show panels and public lectures telling everyone of the wonders of some liberal Islamic reformation, which seems to exert almost no influence outside of educated liberal Western circles. Nonetheless, it seems difficult to consider how the Islamic world might actually go about a renewal of the spirit, and moreover, how it might do so without losing even more of its spirit than it already has done through the “Gordian knot” and Western influence. Although things might seem rather dark, Fabbri (p. 122) ends his book with the optimistic hope for a “New Axial Age”, a renewal of Islam, Hinduism (and presumably Western traditions too) that might emerge by looking back over their histories and rediscovering the moments of luminosity that produced them. Yet because of the narratives of spiritual decline inherent in Voegelinian and Guénonian perspectives, there might seem no real exit beyond simply enduring “modernity without restraint” as best one can. In the words of Peter Sloterdijk on Voegelin, one of the few popular thinkers to engage with his ideas in recent years: “defences of philosophia perennis in the twentieth century frequently become involuntary obituaries instead.” Here Sloterdijk might as well have been speaking of Guénon. The elephant in the room, however, is whether announcing a new epoch like this is not an act of millenarianism in itself. In light of this one should perhaps recall Georges Sorel’s apt observation that it is pessimist desperation that gives rise to millenarian will-to-deliverance and revolution, not optimistic images of the world. Maybe the best we can do is stay positive about what remains of esoteric tradition, name the devil of millenarianism for what it is, and keep an open mind to different traditions, experiences and ecumenical histories. All in all Fabbri has written an amazing little book, as much as it cannot help but seem to be slightly tinged with obituary. I look forward to finding out more about this “New Axial Age”. Barry Cooper, The New Political Religions, or, An Analysis of Modern Terrorism, University of Missouri Press, Columbia and London, 2004. René Guénon, The Essential René Guénon, World Wisdom, Sophia Perennis, Bloomington, 2009. Julius Evola, Ride the Tiger: A Survival Manual for Aristocrats of the Soul, trans. Jocelyn Goodwin, Inner Traditions, New York,  2003; Aleksandr Dugin, The Fourth Political Theory, Arktos, London, 2014. Fritjof Schuon, The Essential Fritjof Schuon, p. 144. Cf. p. 138 uses the anti-philosophical arguments of the Sufis against the philosophical obsessions with laws of causation and the “outer world”. Here Schuon refers to the “best of the Greeks” as those who saw immanent Intellect at work in the world, but even here he has to emphasise that he believes the Arabic mismatch of Plato, Plotinus and Aristotle was superior because Islamic thinkers considered them holy men and used their ideas as a combined instrument to search for the truth. Also see: Ibid, Art from the Sacred to the Profane: East and West, World Wisdom Publihsers, Bloomington, Indiana, 2007, p. 48. Perhaps an anecdote might shed some light on the occasional habit among Traditionalists to pejorate the “Western tradition” in favour of Hinduism and Islam. Many years ago when my old teacher Roger Sworder hired Harry Oldmeadow for his Philosophy and Religious Studies Department at Latrobe University Bendigo, Australia he asked him one important question over the phone: “What do you think of Guénon and Schuon’s attitudes towards the Greeks?” The appropriate answer that got him the job was “They said Plato was the best the West had available. They didn’t say enough.” Sworder spent his whole life in many ways trying to redeem the Greeks (especially the Neo-Platonic tradition) from a Traditionalist perspective. See: Roger Sworder, Mining, Metallurgy and the Meaning of Life, Sophia Perennis, San Rafael CA,  2008. Idem, Collected Works of Eric Voegelin Vol. 21: History of Political Ideas Vol. III: The Later Middle Ages, University of Missouri Press, Columbia, p. 177: “the civilizational destruction perpetrated by a peasant group fighting for the perfect realm does not differ in principle from the annihilation of the world content in the…Cloud of Unknowing.” Cf. Eugene Webb, Eric Voegelin: Philosopher of History, University of Washington Press, Seattle, 1981, pp. 28-9. Eric Voegelin, The Ecumenic Age, esp. pp. 375-6. Pierre Feuga, “Rene Guenon et l’Hindouisme,” http://pierrefeuga.free.fr/guenon.html#_ftnref25 last accessed: 11th July 2017. Also see: René Guénon, Studies in Hinduism, trans. Henry D. Fohr and Cecil Bethell, Sophia Perennis, Hillsdale NY, 2004, p. 168 where he quotes Aurobindo at length against the Freudian unconsciousness. See: Radhakrishnan, An Idealist View of Life, Unwin Books, London, 1970. Mahabharata Vol. II, trans. and ed. by J. A. B. van Buitenen University of Chicago Press, Chicago and London, 1975, Book III. section 188.86-189.12. See: A. L. Basham, The Wonder that Was India, Rupa, Calcutta, 1986, p. 309 which mentions similarities with Christ’s second coming on a white horse as a similarity with Kalki; Zoroastrianism and Buddhism are mentioned as possible sources for the myth too. Wendy Doniger, The Hindus: An Alternative History, Oxford University Press, Oxford, 2010, pp. 486-7. On Shambhala, Kalki and Islam see: Alexander Berzin, “Holy Wars in Buddhism and Islam,” Alexander Berzin Archive:www.studybuddhism.com/en/advanced-studies/history-culture/buddhism-islam/holy-wars-in-buddhism-and-islam last accessed: 19th June 2016; Jan Elvserskog, “Ritual Theory Across the Buddhist-Muslim Divide in Late Imperial China,” in A. Akasoy, C. Burnett and R. Yoeli-Tlalim, (eds) Islam and Tibet: Interactions Along the Musk Road, Ashgate, Farnham UK, 2011, pp. 1-16 and 293-312. On the Soviet use of the Shambhala myth to spread communism: Alexander Znamenski, Red Shambala: Magic, Prophesy and Geopolitics in the Heart of Asia, QuestBooks, Theosophical Publishing House, Wheaton, 2011. Eric Voegelin, The Ecumenic Age, pp. 198. The koranic quotes are carried over onto pp. 199-201. Perhaps Voegelin didn’t like Islam very much, as is suggested in The New Science of Politics, University of Chicago Press, Chicago, 1952, pp. 139-42 where he uses the term “koran” pejoratively to indicate the Gnostic habit of writing heretical third testaments to biblical history. Henry Corbin, Creative Imagination in the Sufism of Ibn Arabi, trans. Ralph Manheim, Princeton University Press, Princeton N.J., 1969. Idem, “Mundus Imaginalis, or, The Imaginary and the Imaginal,” Zurich, Spring 1972, available from: https://ia600201.us.archive.org/28/items/mundus_imaginalis_201512/mundus_imaginalis.pdf last accessed: 6th July 2017. For a commensurate overview see: Dennis L. Sepper, Descartes’ Imagination: Proportions, Images and the Activity of Thinking, University of California Press, Berkeley, 1996, pp. 19-25. Jonathan Ratcliffe, “The Messianic Geser: from Religious Saviour to Communism,” Paper delivered at Geser Studies Conference, 23rd June 2016, Buryat Scientific Centre, Ulan Ude. English and Russian versions. http://anu-au.academia.edu/JonathanRatcliffe last accessed: 6th July 2017. Mohammad Rafi, “Re-Working the Philosophy of Martin Heidegger: Iran’s Revolution of 1979 and its Quest for Cultural Authenticity,” Telos Press, 19th April 2013, http://www.telospress.com/re-working-the-philosophy-of-martin-heidegger-irans-revolution-of-1979-and-its-quest-for-cultural-authenticity/ last accessed: 6th July 2017. Martin Heidegger, “The Self-Assertion of the German University,” in Richard Wolin, The Heidegger Controversy, MIT Press, London, 1993, pp. 29-39; idem, Nature History and the State 1933-1934, trans. Gregory Fried and Richard Polt, various contributors, Bloosmbury, London, 2015. Yuk Hui, The Question Concerning Technology in China: An Essay in Cosmotechnics, Urbanomic, Falmouth, UK, 2016, pp. 241-69. Aleksandr Dugin, The Fourth Political Theory; Alexander S. Duff, “Heidegger’s Ghosts,” The American Interest 11/5 25th February 2016, http://www.the-american-interest.com/2016/02/25/heideggers-ghosts/ last accessed: 17th September 2016. Janet Afary and Kevin B. Anderson, Foucault and the Iranian Revolution, University of Chicago Press, Chicago, 2005. Cf Slavoj Žižek, In Defence of Lost Causes, Verso, New York, 2008, esp. pp. 107-17. Exemplary is this book: Paul Berman, The Flight of the Intellectuals, Scribe, Melbourne, 2010. This is little more than a kind of rather ineffectual beat-up about Ramadan, all based on his father’s connections with the Muslim Brotherhood rather than the thinker’s own character. The conclusions of its author were simple: replace the public intellectual Ramadan with another, Ayaan Hirsi Ali. What’s so special about Ali? She’s an ex-muslim, she loathes Islam and campaigns against it. Ergo, the only good Islam in Europe (or possibly everywhere) is no Islam. Peter Sloterdijk, In the World Interior of Capital, trans. Wieland Hoban, Polity, Cambridge UK, 2016, p. 283 n.4. Georges Sorel, Reflections on Violence, trans. J. Roth and T.E. Hulme, Collier Books, New York, 1961, pp. 34-6. Jonathan Ratcliffe is Associate Editor of VoegelinView and a doctoral candidate in Asian History at the Australian National University. He is working with Chris Heggie-Brown on a history of technology and politics, provisionally titled "Voegelin Among the Machines."